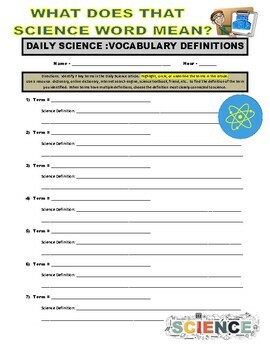 This purchase is for a DAILY SCIENCE informational article which is ideal for science or language arts classrooms. These articles provide a perfect, and short, article that showcases a wide selection of science themes. Each article and assignment should take 5-10 minutes (depending on grade and student reading ability) which makes them ideal for classroom warm-ups, extra credit, or time filler work for early finishers. I often use the articles for inclusion during exams or tests where a short informational reading passage helps prepare students for state testing reading selections. 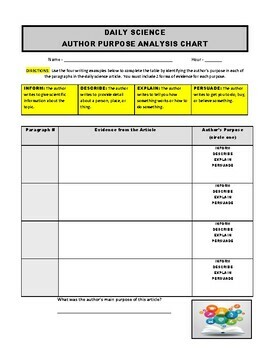 I have also included an author purpose chart which can help strengthen student ability to identify in each paragraph and find evidence to support whether the author is writing to: inform, describe, explain, or persuade. 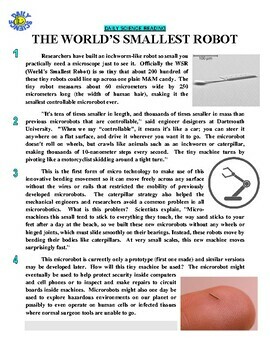 This daily science article focuses on the world's smallest robot. A perfect addition for any STEM unit or technology classroom. The assignment is provided as an MS-Word document to allow easy editing to best fit the needs of your students. Thank you for your purchase and for taking the time to leave me positive feedback.